To ensure total air filtration, there are several important factors to consider. The first and most important factor is carbon grade choice. Grade RC-48 carbon is derived from an ancient black coal deposit found only in Western Australia. The particular deposit is dated at over 250 million years old. After being extracted, the RC-48 carbon is kiln activated at 1200°C in a saturated steam atmosphere. It is this process together with the coals unique density that causes the pores in the carbon to form. This activation process makes the RC-48 carbon incredibly effective for the filtration of organic particles and other airborne materials. 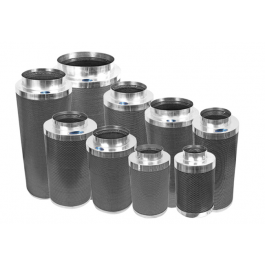 Because we use the purest available "activated virgin" carbon and our granulated carbon has more surface area than pelletized carbon, we can use significantly less carbon, thus making our filters half the weight of competitive filters. 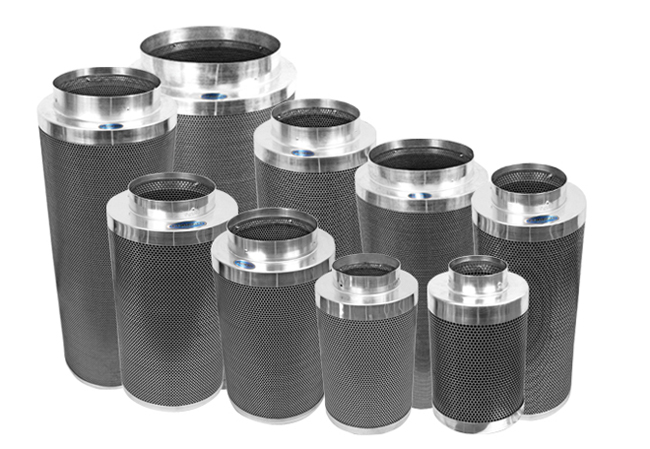 Other key factors that have been incorporated into Phresh® Filters are a perfect combination of granulate size, carbon surface area and carbon bed depth. The world's lightest carbon filters, at less than half the weight of competitors, Phresh® Filters are easier to handle, install, transport and remove. Phresh® Filters are used by labs, plant breeding, germplasms, tissue culture and commercial greenhouses for their total airstream filtration requirements. This professional-grade equipment is now available to hobbyists world-wide. Control your growing environment with the best filters available on the market. CTC or "airstream removal tests" (ASTM D 3467-94) prove that our carbon can absorb 108.3% of its own weight. This is how our small, but powerful filters produce higher CFM and filtration at half the size & weight of competing filters. To get the optimum product life from your Phresh® Filter, it should be used with the provided pre-filter sock. This pre-filter sock catches the large dust particulates and foreign materials which if allowed to come in contact with the carbon will ultimately clog the outer surface of the carbon before total internal saturation has been achieved. When this happens it unnecessarily shortens the product life of the filter. It is recommended that the pre-filter be machine-washed or replaced every six months. Extremely dusty environments may require a more regular cleaning program. Ideally, maximum air temperatures should be kept below 95° F (35° C). Relative humidity should be kept below 75% at all times. Remember, carbon will absorb moisture and will take up "space" in the carbon particulate, reducing its life span. There is no given limit to the life expectancy of RC-48 carbon and your Phresh® Filter. The total life span can only be governed by the amount of impurities absorbed by the carbon over time. The rate of air movement through the carbon bed, total air impurities and climatic conditions are the factors that determine the speed at which the porous carbon granules reach maximum capacity. Phresh® uses only RC-48 carbon. There is a global industry standard where carbon is tested for "ID factor" and are given an "iodine number" to American ATSM standards. ID factor can simply be explained as the measurement of the amount of iodine in milligrams that can be absorbed by a single gram of activated carbon. The higher the ID factor, the higher the absorption rate. The average coal based carbon is around 500 mg/g ID. On the other hand, RC-48 carbon has a guaranteed analysis of 1050 mg/g ID. All this said, as a guide rather than a rule, we suggest that a Phresh® Filters will last a typical user around two years.